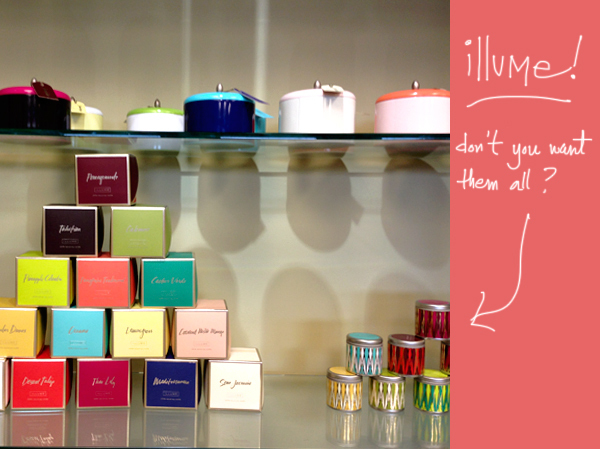 This post is brought to you by Illume Candles. A couple of weeks ago, over the weekend of my Minneapolis mini-camp, I was invited to spend a day at the Illume Candles headquarters. Look! They made me a sign, y'all! The creative team and actual candle-making factory are all contained in one building, so I got to see lots of exciting things, starting with their shelves and shelves of already-made candles. I accidentally stole them all. 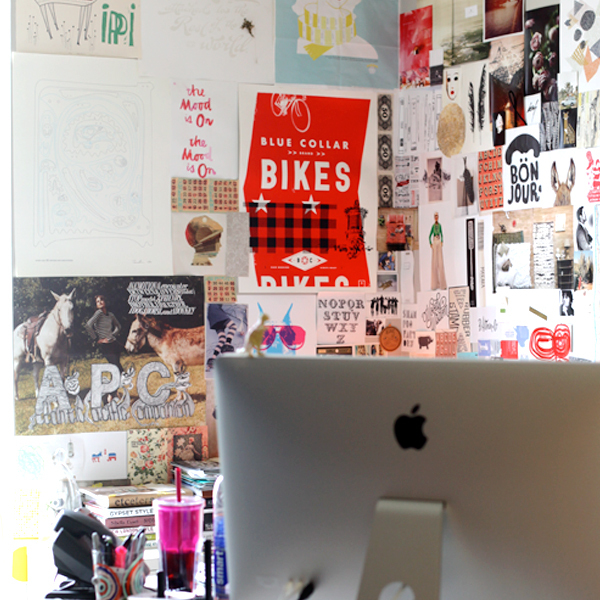 The creative team's offices all look like this. I am not sure how they became so cool, but I was not asking questions. I was mainly gawking. "Oh, I think I'll just play with some watercolors here on this table, trying to come up with some ideas for next year's designs," said a cool person who knows how to use watercolors. 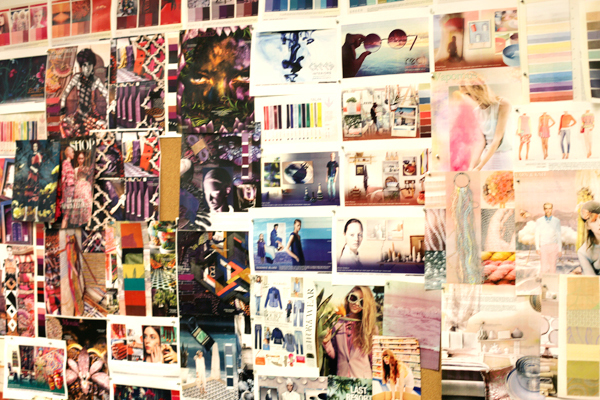 Don't you wish your inspiration board were baller like this? I do. 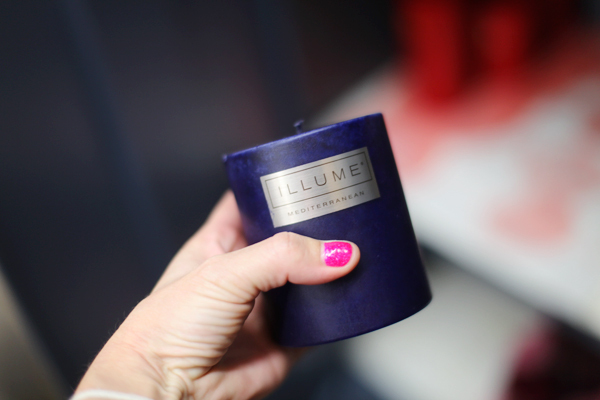 After a little tour and a few minutes drinking coffee and walking around meeting everyone -- yeah, I met the CEO of Illume Candles, we're best friends now -- it was time for a tour of the factory. 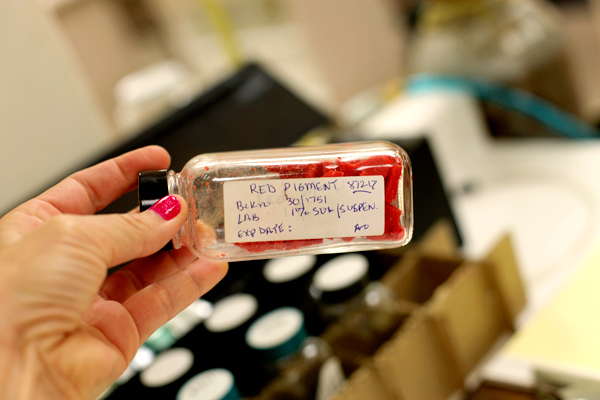 There was one room dedicated to all the different fragrance oils, powders, and pigments. And there were wicks! So many wicks, you guys. Did you know that the wick is chosen depending on the particular candle? Now you do. Something is happening above which I do not remember, but which I do know looked super cool. I was tempted to pocket those awesome wooden squares, but I did not, because my outfit didn't have pockets. Then we went to the back of the factory, and all of a sudden I was in an episode of Breaking Bad. 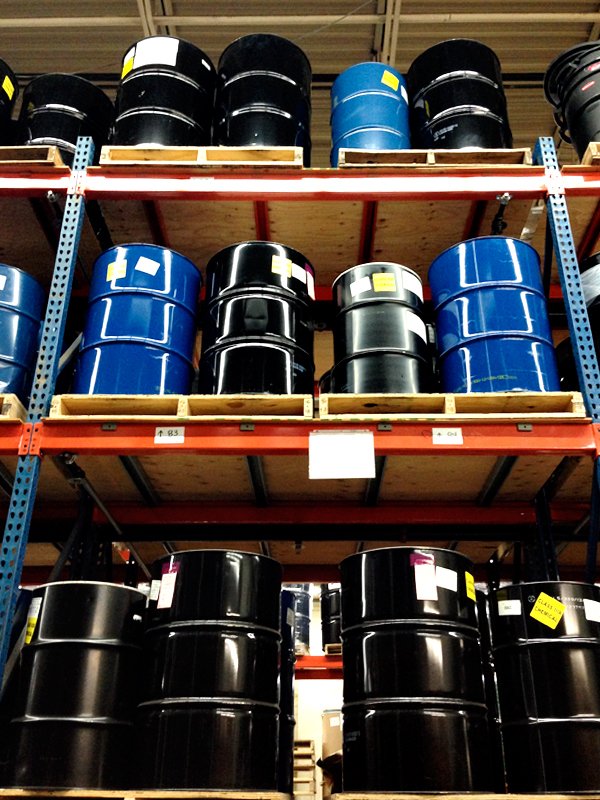 I was assured that there were no meth-making products on these shelves. Allegedly. Making candles: it's kind of like baking with Crisco. 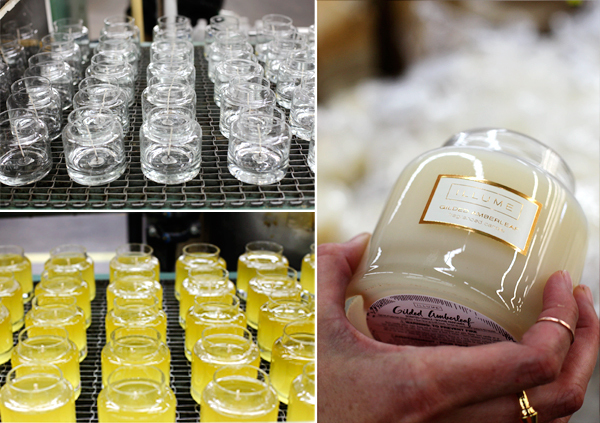 Each candle has its own individual recipe, and everything has to be measured and checked off extra-carefully to ensure identical quality across batches. This is just one of the vats that the candles are mixed in. I resisted the urge to taste it. Wick-holder-downer thingers! These are for safety, so that when one's candle burns to the bottom, there is still a little wax left and no one starts a fire. Also they are for looking really cute in large barrels. The wick machine, which -- you guessed it! -- attaches the wicks, is apparently very fancy. It's German, from whence many fancy wick-machines hail. These gorgeous pillar candles are made in something that resembles a springform pan. See? 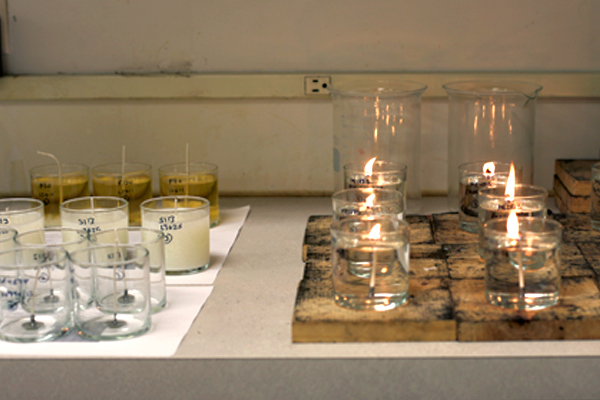 Candle-making: it's a lot like baking. Except, sadly, you cannot eat the end product. 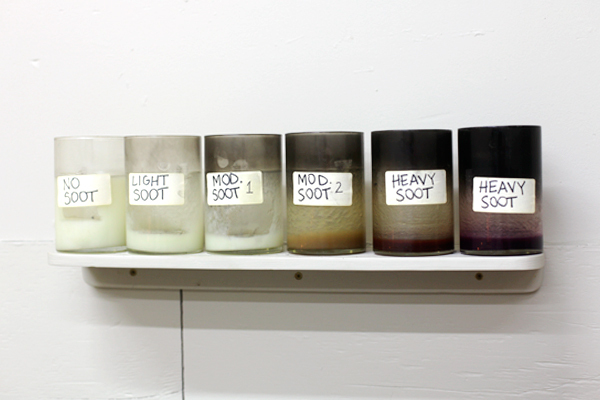 Here is an Essential Jar candle, from start to finish. Please also note Jenny's cool rings. And, suddenly, the tour was over. I was a little sad, because I could have stayed in that factory all day watching and learning. To assuage my sadness, Jenny (my Illume contact, tour guide, and other new best friend) had planned something called Crafternoon, during which time the creative staff all sat around a big table eating chocolates and mod-podging fabric onto trays. Apparently they do something like this every week. Um, WHAT? Hi, I work here now. We got the tray idea from Martha Stewart, and the fabric from Josi Severson (in whose adorable shop I held my camp!). Since the people at Illume are basically the sweetest people in all the land, they sent me home with lots of candles. The ones you see below are their Coconut Milk Mango pillars, and, along with smelling super-dreamy, are the perfect shade of pale pink. I've been really into pink lately. Jenny encouraged me to burn several candles at once to make up a WHOLE NEW SCENT, and...y'all, she is kind of a genius. 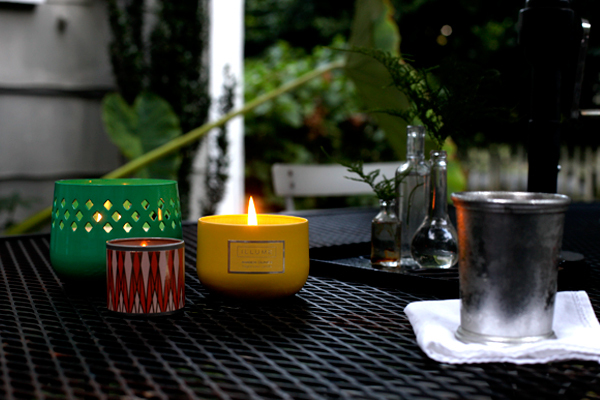 Below: Garden Sage Starlight Tin, Amber Dunes Essential Tin, and Coconut Milk Mango Essential Mini Tin. The combined scent smelled like butterscotch and summer. I'm still sitting here, right now. Thank you so much to everyone at Illume for such a fun adventure! I hope to burn your candles for many days henceforth. I'll be back next week for Crafternoon.